Last week-end, I was in the mood to have cavatelli. 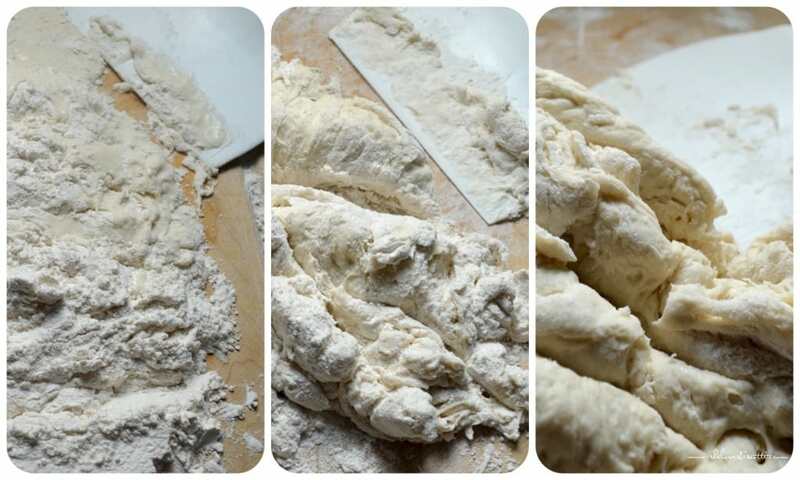 I would like to share with you my families’ method of making this Homemade Cavatelli Pasta Dough Recipe. Don’t get me wrong, I love the dough attachment of my stand mixer, but occasionally, when I have the time, I love to make cavatelli the “old-fashioned way”. I know what you are thinking… who’s got the time for this? Let me assure you that there is something therapeutic about cutting and rolling and shaping dough. It brings back so many wonderful memories of my mom. And so, last week-end, I made the time to make this cavatelli pasta recipe. 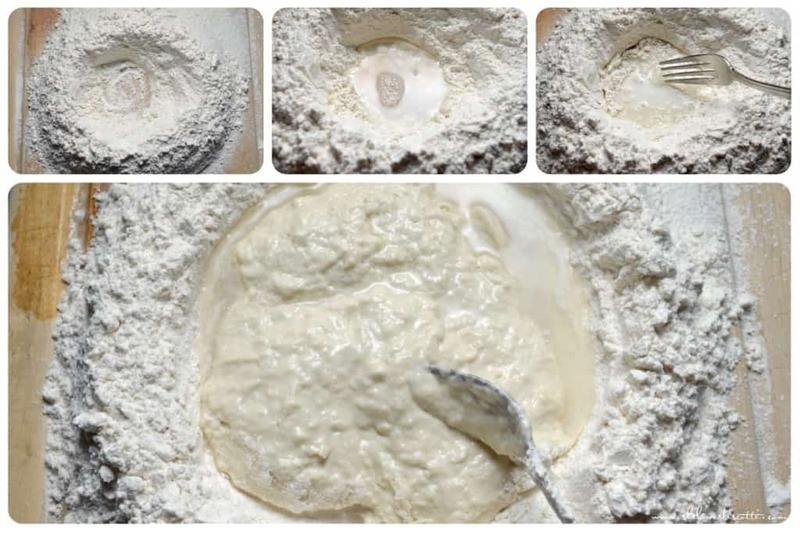 Feel free to use your stand mixer with the hook attachment; but there is something so special about kneading dough and making pasta from scratch…yes, I agree it is very labor intensive. But you can’t deny that sense of satisfaction that comes from making your own pasta! And this is a very forgiving dough, so let’s get started! Flour. All-purpose flour, bread or semolina flour are all options. I use all-purpose flour. That’s it! Are you surprised to learn that something so delicious is made with just these ingredients! It all starts with a mound of flour. Shape the mound of flour into a well on your wooden board. Would you believe it if I told you that my grandmother and my Mom would make their cavatelli (and taralli and this Italian sweet ricotta Easter pie, among other goodies!) on a wooden board that measured 3 x 5 feet! Believe me when I tell you that as kids, this was our play dough…edible play dough. Okay, back to the well…slowly pour the room temperature water in the middle of the well and with a fork, slowly incorporate the flour. Keep beating the flour and incorporating the water a little bit at a time. My grandmother would do this with her hands. It would get a little messy! Continue to slowly add the water while mixing. I start the whole process with a fork, and eventually I use a dough scraper (stainless steel or plastic works well). During this process, make sure the water does not run out from the inside of your “flour” well. 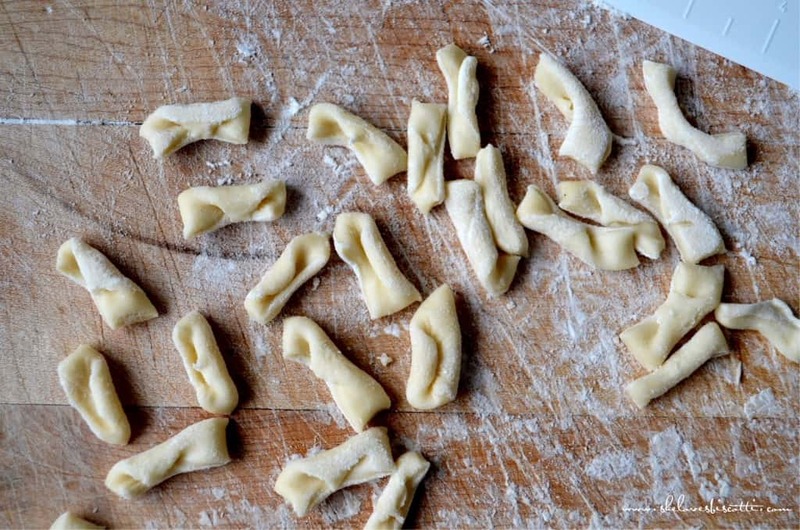 You can experiment with different types of flours until you achieve the cavatelli you like. You can use semolina, bread or even all-purpose flour. The cavatelli I was grew up with was made with bread or all-purpose flour. 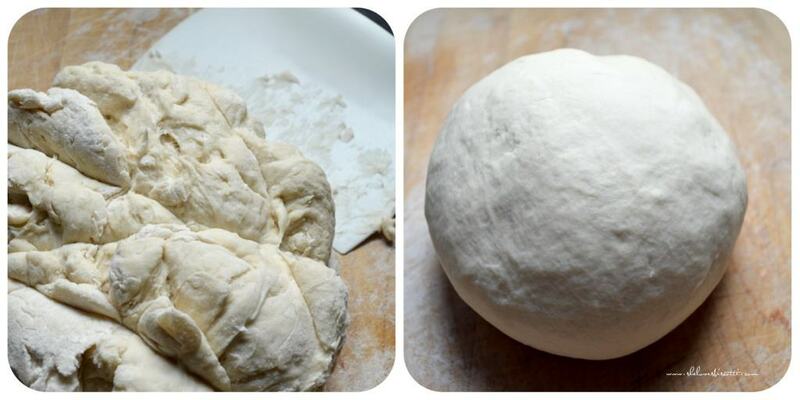 …develops into one ball of dough. At this stage, it becomes a lot easier to knead. Keep kneading for about ten minutes or so. You know you’re done when you end up with a clean board and clean hands…and just like that, the sticky mess is no more. Wrap the cavatelli dough in cling wrap and place a tea towel over the top. Allow to rest for about one hour at room temperature. This resting period allows the gluten in the dough to relax. As a result, it will be easier to roll out the dough. Now we can start shaping the cavatelli! Uncover the cling wrap and place on a floured wooden board. With a knife or dough scraper, cut your beautiful ball of dough in quarters. 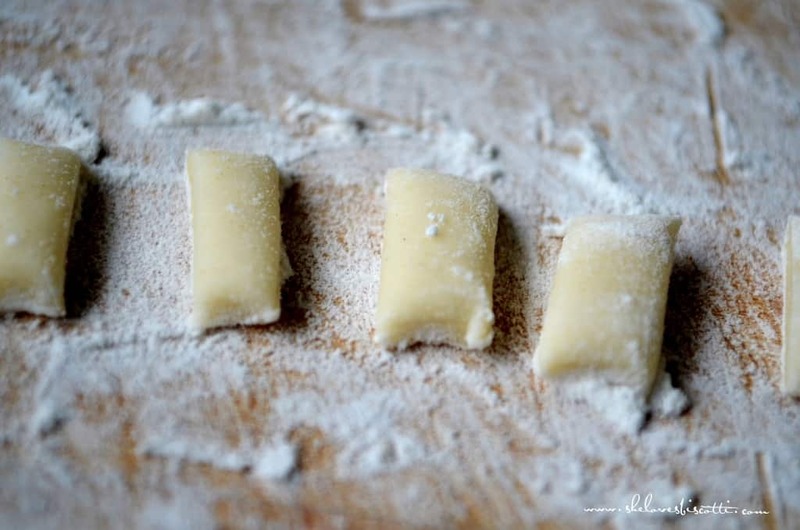 Make sure to re-wrap the cavatelli dough that you are not working with to prevent it from drying out. It never ceases to amaze me that with only flour and water, you can make this cavatelli recipe! Another thing that never ceases to amaze me is the different variations in which you can shape your cavatelli. My mom (and grandmother) would roll out the one large piece of dough (on their wooden board measuring 3 x 5 feet) and wrap it around the rolling pin (which would measure 4 feet to keep in line with the board, of course). We are talking mass production here… I wrapped up my little quarter piece of dough just to show you how they did it. And so this pasta dough would be rolled and stretched. No pasta rollers back then…everything was done manually. Since we are not working with industrial measurements, I will just roll out my dough to about 1/8 -1/4 of an inch thick. (There are some families that roll their piece of dough in a log and cut off pieces that way). Feel free to use your pasta roller, if you have one. 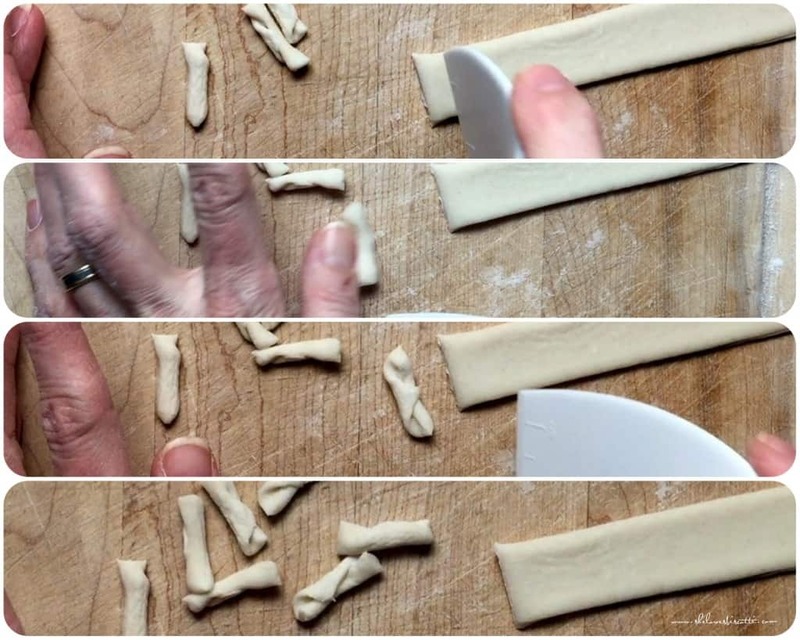 Then you want to cut the dough in 3/4 inch strips. And each strip in 1/4-1/2 inch little pieces. You can really cut them any length you want. 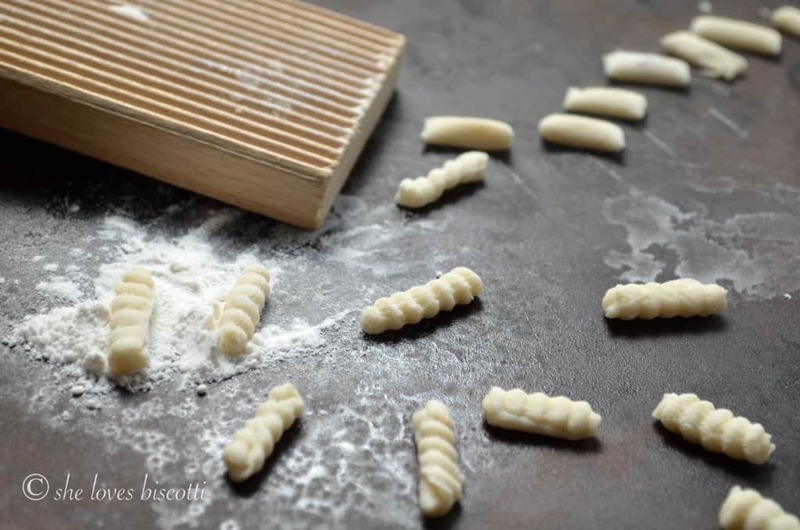 There are some families that will form their cavatelli with 2 fingers, some will use a wooden board which has groves in it and drag their pasta up against the board, I have seen some use a knife in order to get a little indentation. 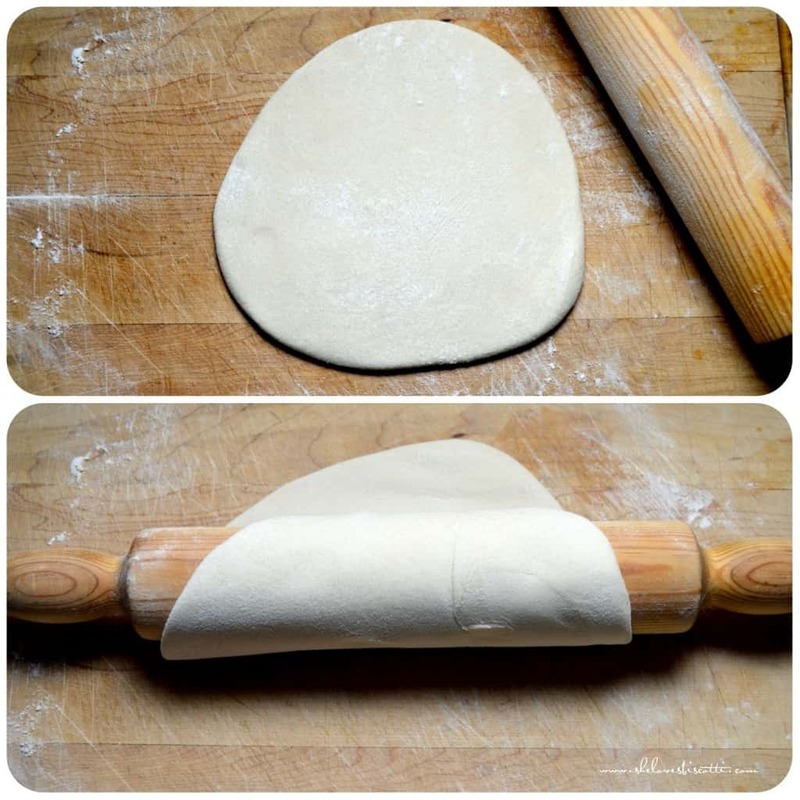 I was brought up to use the index finger and apply a gentle pressure on the dough, dragging it toward you. There should be a slight curl formed. The word cavatelli is derived from the word cavato which means “carved”. Essentially, you are carving the dough. It’s important to realize that homemade pasta is rustic looking, that is not mechanically produced, as a result, there will be imperfections. Therein lies the beauty. 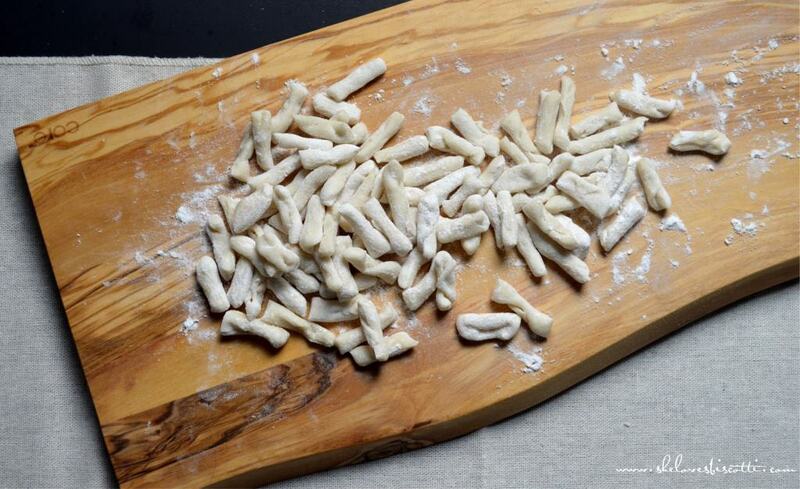 As you are making your cavatelli, place them on a baking sheet which has been dusted with flour in a single layer. The dough is soft and they will stick together if they are not separated, so make sure they don’t touch each other. Continue until all the dough has been formed into cavatelli. Allow to air dry for at least 30 minutes. If using immediately, drop the cavatelli in a large pot of salted boiling water for a few minutes. The cavatelli are done when they float to the top. (Try to shake off as much as the flour as possible before boiling them). Taste to make sure they are al dente. If freezing, place the tray of cavatelli in the freezer and once frozen, place in plastic bag in the freezer. These frozen cavatelli will take about 6 minutes to cook, no need to thaw. Always taste them to make sure they are cooked to your liking. 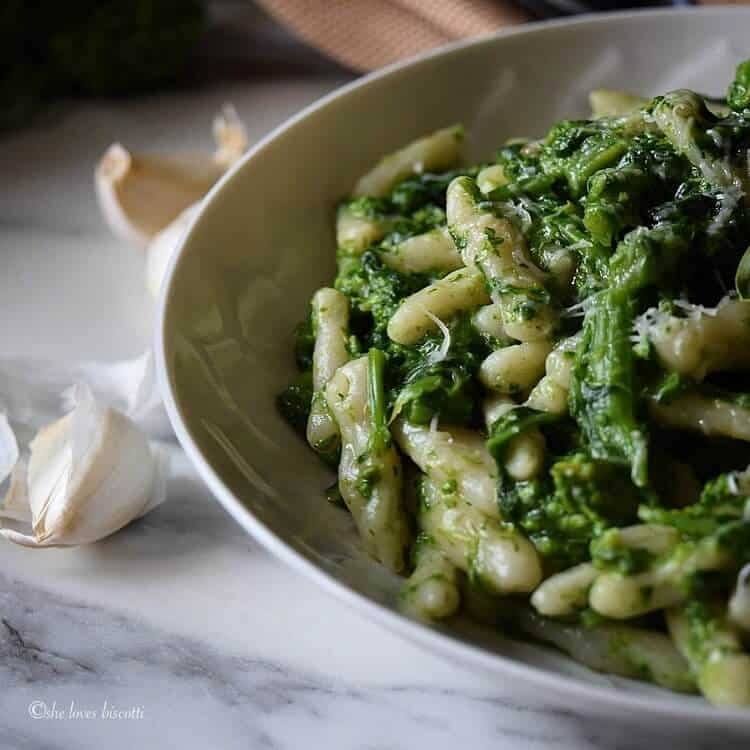 And then the only thing left to do is serve them with your favorite sauce; one of my favorite pasta recipes is this Homemade Italian Broccoli Rabe Cavatelli Pasta. 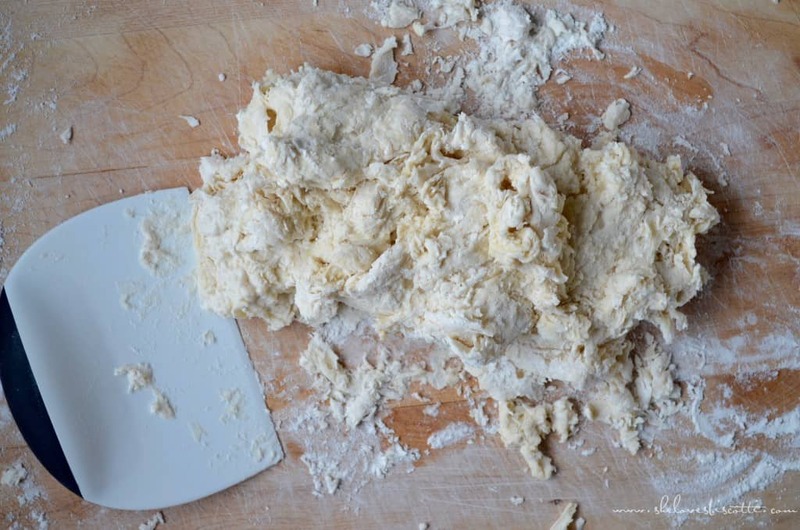 This pasta dough recipe is one that I grew up with. My grandmother and Mom would make these gavadeel at least once a month, where it would be combined with ricotta and tomato sauce. I guess that is why I still enjoy making and eating this pasta. It brings me right back to my childhood, where it was “normal” to make your own pasta and to get the kids involved in the process. Making cavatelli truly is a great way to get the younger kids involved in cooking. 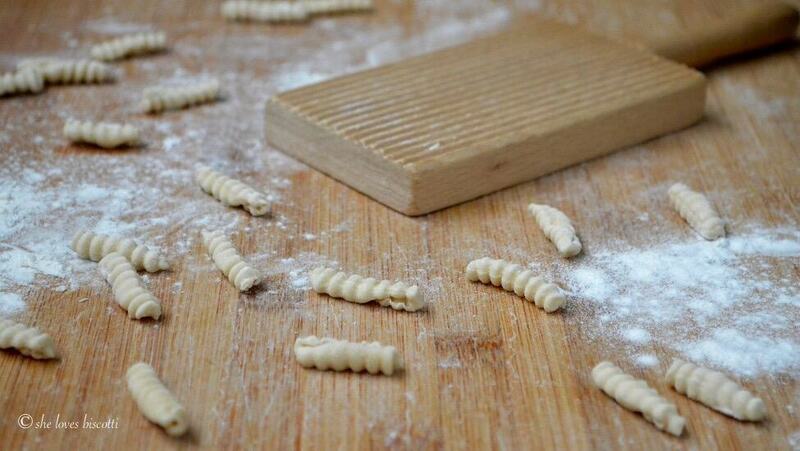 You would be amazed how much kids enjoy this simple activity of making cavatelli. 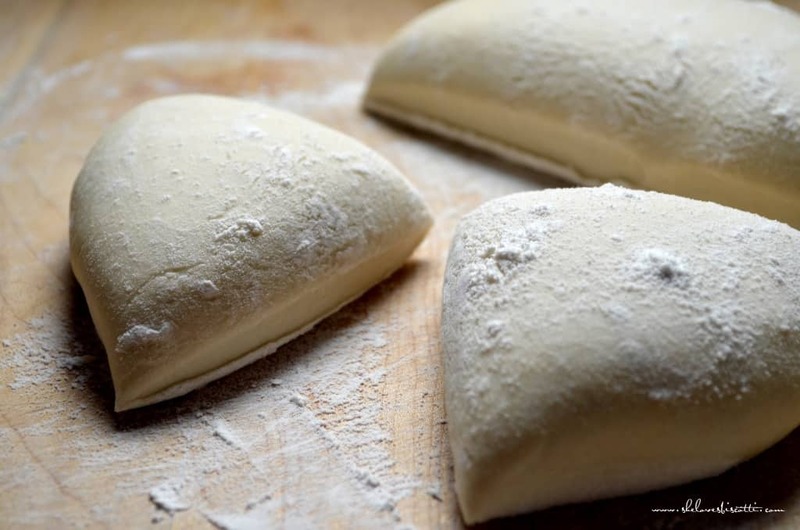 Flour and water…the original playdough! 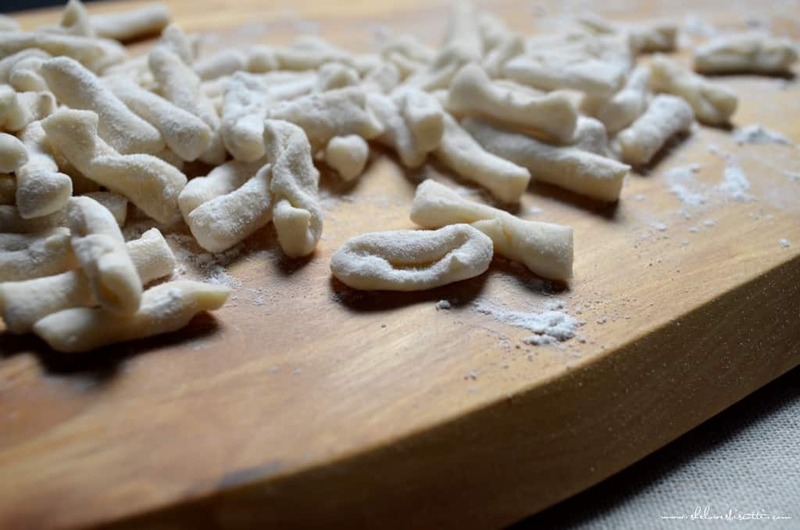 If ever you have a little bit of time, you can make this easy homemade pasta dough recipe and enjoy simple, rustic casalinga-style cavatelli. ★★★★★ If you have made this Cavatelli Dough recipe, I would love to hear about it in the comments below and be sure to rate the recipe! 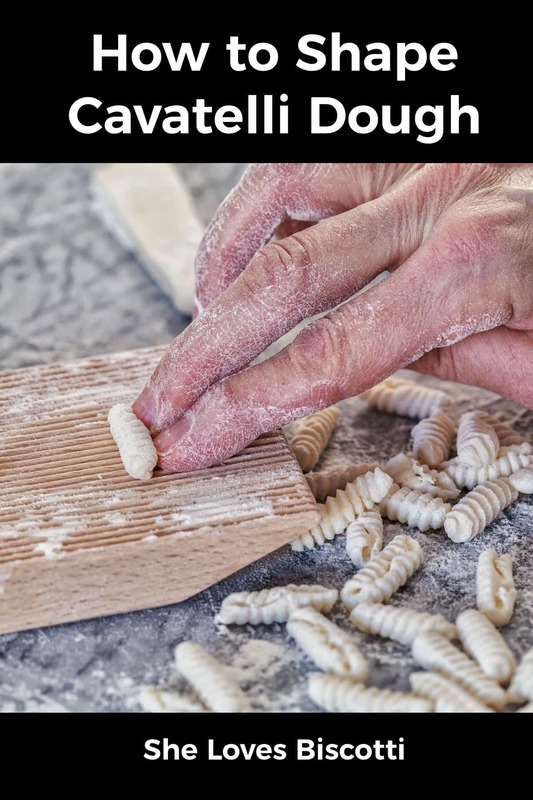 Learn how to make this Homemade Cavatelli Pasta Dough Recipe & enjoy simple, rustic casalinga-style pasta with your favorite sauce. Place the sifted flour on a wooden board and make a well in the center. Add the water and the salt in the center of the well. With a fork, start incorporating the flour and the water until you get a thick batter. Pull in the flour from the bottom of the well. With the help of a dough scraper, incorporate the rest of the flour (it may appear to you that there isn't enough water...just keep kneading...magically everything comes together). Knead for about 8-10 minutes or until dough is smooth and elastic. If the dough feels sticky, add a little bit of flour. If, on the other hand, the dough feels dry, sprinkle a few drops of water over the dough and continue kneading. Wrap dough in cling wrap and let it rest for about one hour at room temperature (I will usually place a tea towel over the top). 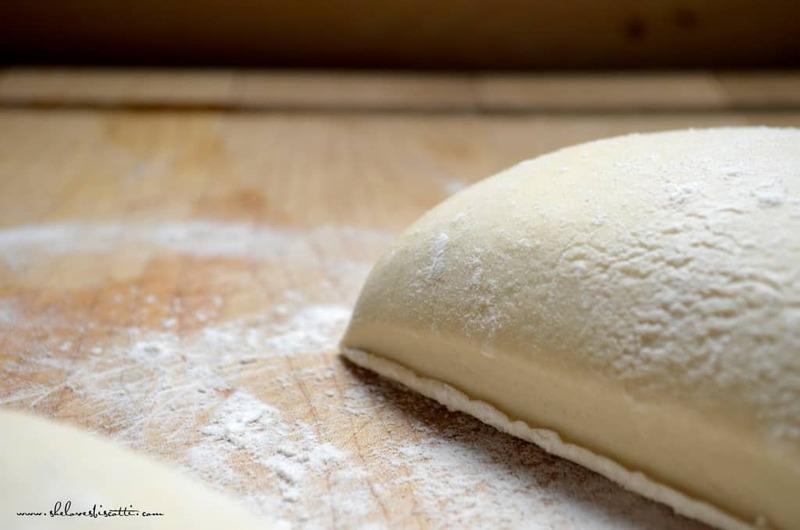 Roll out each piece of dough to approximately ¼ inch thick. Make sure your board and rolling pin are floured. Cut the into ¾ - 1 inch strips. Cut each strip into 1/4 - 1/2 inch rectangular pieces. 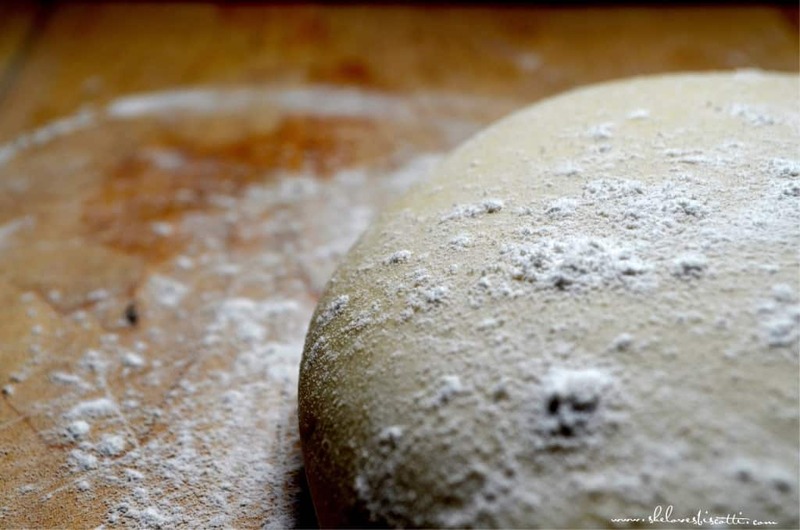 Using the index finger, apply a gentle pressure on the dough, dragging it toward you. There should be a slight curl that forms. Place cavatelli on large baking sheets that have been dusted with flour. Place the cavatelli in a single layer and not touching one another. Continue until all the dough has been formed into cavatelli. Allow to air dry for at least 30 minutes. If using immediately, drop in a large pot of salted boiling water for a few minutes. The cavatelli are done when they float to the top. (Try to shake off as much as the flour as possible before boiling them). Taste to make sure they are cooked to your liking. If freezing, place the tray of cavatelli in the freezer and once frozen, place in plastic bag in the freezer. Can be cooked frozen. (Should take 6-8 minutes to cook. Once they rise to the top, they should be done. Taste to make sure they are cookedto your liking). You can substitute the all-purpose flour with bread flour, or a mixture of the two. You can also replace up to half of the all purpose flour with semolina flour. Cavatelli can be stored in the freezer for up to 6 months. I haven’t made this recipe yet but am anxious to try it. 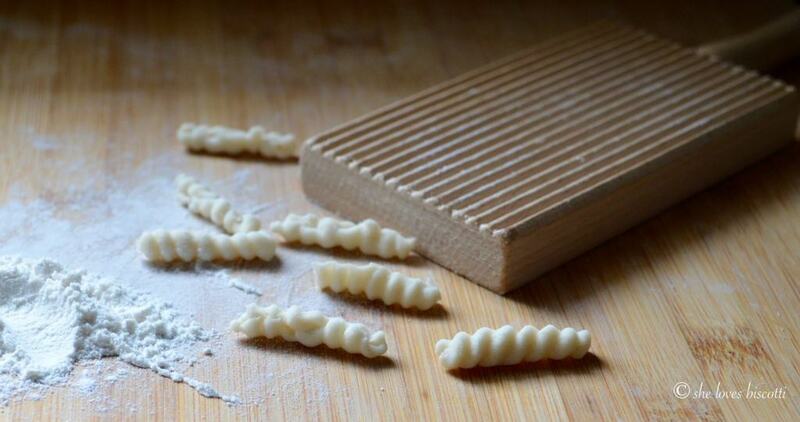 Your photos show a ridged board used for cavatelli and gnocchi. Do I need that to make this recipe? Thanks! Hi Lisa, no it is not required. As you can see, it does provide a “prettier” shape but the taste is just as awesome without it. Great question. Thanks so much for stopping by, appreciate it! Love your blog, its the one I always return to, top of my list. Just tried the cavatelli with rappini, did some cavatelli in advance and froze as I was receiving a large crowd…was a hit! have been doing cavatelli, not often enough, over 30 years but maybe once a year on special ocasions. Used my mom’s recipe, no exact measurements LOL, was good, but only thing i was making too much, i guess using too much water and flour, and by the time i finished making all, my back was out. Now i decided i needed to compare my recipe to someone, so i chose yours LOL, because i trust your recipes….no regrets!!! What i love is the precise measurements and reasonable quantities so i can do a little at a time. Also love your tips. I am thrilled to hear you enjoyed this cavatelli recipe… just like you, I have been making cavatelli for over 30 years and it never seizes to amaze me that with just a little bit of water and flour, you can make this amazing pasta dish. Thanks again Antoinette for taking the time to share your experience with this recipe, appreciate it! Thanks for posting this, Maria! My son and husband came home with one of the hand-cranked cavatelli makers a few weeks back. I have helped my mother-in-law and sister-in-law make them before, but never by myself. Since we live 300 miles away from them, my family is very hungry for them, so I said I would give it a try. My mother-in-law never uses a recipe so I am grateful that you have posted one. My grandmother made gnocchi but never cavatelli! I have loved reading everyone’s comments here, too. Growing up in an Italian family is like nothing else. To be honest, I have never used a cavatelli maker… it’s been on my “to get” list for the longest time. Have fun making the cavatelli! A well documented set of instructions for preparing cavatalli. Your instructions are spot on but the carefully detailed photos provide the inexperienced reader with the necessary guidance. Excellent post Maria! Thanks so much for your kind words Paula! As you know, there is a time investment when making your own pasta -cavatelli are no exception. However, your taste buds will reap the benefits!!! Reading through the comments I became very intrigued by a white lasagna mentioned. Is this a recipe that’s on your site?? I couldn’t find it. I SO ENJOYED this !!! It reminded me of when my Mother-in-law came to visit us and made Cavatelli, while our Son Rocco and daughter Angelina watched, to this day Rocco is the Cavatelli maker 🙂 And has two children of his own that also Make pasta with their Dad. I bought him the Cavetelli machine, so he doesn’t make it the natural way 🙂 He also has his Grandmoms board just like the one you speak of. My Mother was Italian also but she worked a full time job to raise her four children and did not make her own pasta, but was an awesome cook, and baker !!! Thank you so much for your kind words 🙂 I am happy it brought back so many wonderful memories. I love that your son makes cavatelli with his kids. 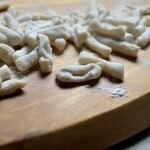 Loved reading your Homemade Cavatelli Pasta Dough Recipe on how to make it. As a child we made homemade pasta for all the holidays. I still love making it, instead of using store bought. Cleaning out a closet at my Mom’s house and I found an odd part of a machine I thought, but she told me it was my Great Aunt’s and that it was now hers. It is to make Cavatelli Pasta but she did not have the recipe and thought that she should use Potatoes. So I just went in search of how to make cavatelli and it lead me to your site. Hope to have a fun time making cavatelli with my mom in the next few months. What a wonderful treasure you found! I love your story, thanks for sharing Barbara. As you probably know, there are so many variations when it comes to Italian regional cooking, I hope you find the recipe that best represents the recipe you grew up with. I think what is important is to preserve and share those memories, while creating new ones. Enjoy creating new memories with your mom 🙂 Buona Pasqua to you and your loved ones. I rember making them with my grandmother it’s been so long like you I’ve been longing for them so I’m making them for Easter! And you’re absolutely right all the kid’s need to get involved it’s defiantly a family thing!!! Thank you! We also ate polenta old world style, off of our macaroni board. My father would pour it out of the pot onto the board and ladle the sauce over it with the meats and salad on the side. The entire family would then eat off the board. My new sisters-in-law got the biggest kick out of this and we continued doing this even after their kids were born. I was an adult and out of the house before I ever had polenta on a plate. I still have that board though it hasn’t been used in decades, just don’t have the heart to get rid of it. Great memories. I had no idea you could cook homemade pasta from frozen. That’s great as it means you can make a big batch and then freeze the leftovers. I love kneading too, it’s so therapeutic when I’ve got the time for it, although I have to admit to taking the dough hook option more than I’d like. BRAVO….i am inspired to try this, i remember my mom making these with pepperoni sauce, the children always called them bullets…. Love you directions! My Mom made her own pasta but I remember her putting in eggs in her dough and yours just had flour and water. Have you heard of that? Such a beautiful dough!!! Homemade pasta is nothing short of amazingly delicious. We have pasta roller and cutter attachments for our KitchenAid mixer that make the preparation very easy. What a virtuous endeavor! I feel like a complete slouch and I’m a make from scratch cook, too. It’s amazing what you can do with just flour, salt and water. I appreciate the time and effort you put into this. The last time I made homemade gnocchi like this was after a trip to Rome a couple years ago. You have brought me right back to the class my husband and I took and the wonderful instruction we received along with the phenomenal flavor of this amazing pasta and art form. Brava! I completely identify with your comments. First of all, I learned high production in my mother’s kitchen. Restaurants have nothing on the amount of volume my mother can produce from her kitchen. I spent many, many hours with my mom making just this sort of thing and so understand the nostalgia that goes along with it. When it was so messy, my mother would say, “Stop. Go wash your hands and let’s get back to it.” Your photography and step-by-step instructions are great. Thanks for this post.